We provide high quality and comprehensive Computer Aided Design services and is a solution for CAD contracting services like Auto CAD drawing drafting, CAD conversion, CAD digitization and Conversion of manual drawings to CAD. With our highly skilled and experienced engineering team & consultants, we ensure the best quality and accurate conversion to a world class standard. We specialize in CAD conversion services in areas such as architectural plans, topographic maps, facility plans, site survey plans and civil, mechanical & construction engineering drawings. 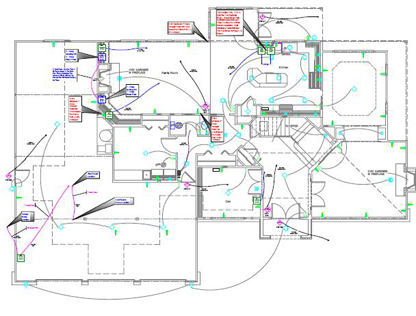 We convert your paper, blueprints, scans, drawings (Engineering, Architectural, Construction drawings, Maps, etc.) to editable CAD format files / Vector Data. Our conversion process involves either tracing or redrawing by our experienced CAD draftsmen and offer accurate to scale drawing rather than using auto-vectorization tools. The drawings are standardized to overcome individual drafting styles on paper. The entities in each paper drawing are identified and extracted to create standard layers / levels and other specifications of text styles, heights, dimensions styles, symbols etc. The entities from the drawings can also be separated into various drawings in order to segregate the structural entities from the mechanical entities. The structural drawings can then be externally referenced into other drawings to minimize the editing and updating efforts at a later stage. In order to digitize your raster images, we create a drawing as a new file; the final output is editable and will be in DXF or DWG format and can have as many layers as you require. We are able to digitize your raster images (drawings, logos, and graphics, etc. ; TIFF, JPEG, GIF, PDF, etc.) into fully editable, multi-layer vector format (i.e. DWG, DXF, Adobe Illustrator, PhotoShop, CorelDraw or any other desired vector format).